We have FREE GROUND SHIPPING on any order shipped to the lower 48 states! Designed for personal tracking this waterproof, long life tracker is perfect for clipping to a backpack, sutcase or shoelace for safety or to settle a suspicion of bad behavior. Track it live with our free ITRAIL GPS app. 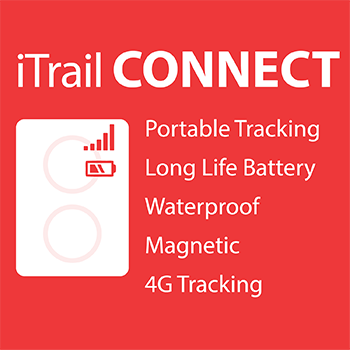 Super-strong built in magnets make the iTrail CONNECT a great choice for asset tracking. It will cling to a moving vehicle in almost any weather condition. Waterproof with a long life battery, this tracker also features wireless charging. Track it live with our free ITRAIL GPS app. Our original hand held tracker is battery operated and light-weight enough to ride unnoticed in a purse or backpack. Slip it in the glove compartment to track a vehicle. Get live updates using our free iTRAIL LIVE app. 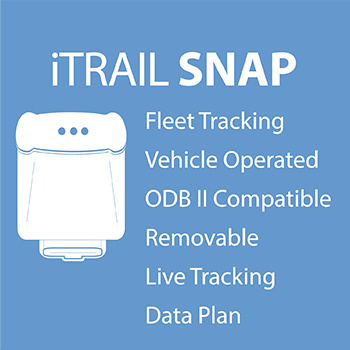 Designed for vehicle and fleet tracking iTrail SNAP locks into your car's OBDII port. Afer quick installation it is powered by the battery and updates its location via the free iTRAIL LIVE app. 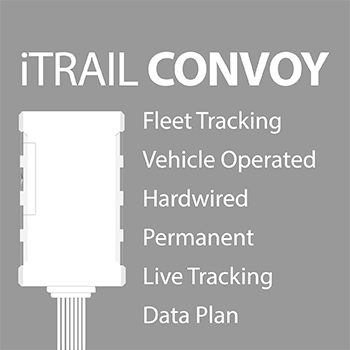 Hardwire fleet tracking with a 12 hour back up battery makes this a rugged and dependable fleet vehical tracker The external antenna allows for pinpoint accuracy that can be tracked with the free iTRAIL LIVE app. GPS trackers help you make sure the most important people and things in your life are safe. Tracking your family, you’re teen, your nanny, know they arrive safely and on time with a text or email using are easy Alert system. Create boundaries and routes using our GeoFence system. If there is trouble the portable units come equipped with a built in panic button. Get the locations in seconds using our convenient Web portal or mobile viewer. Effectively managing trailers, sheds, heavy equipment that are in the field, requires knowing where they are at all times. Track any object or asset that has personal or professional value to you and needs to be monitor. 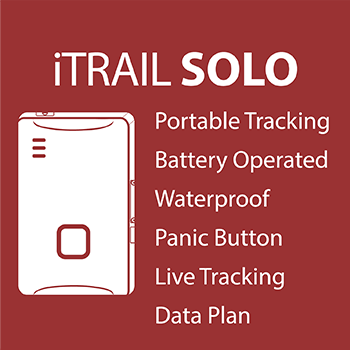 Instantly track it using our iTrail tracking software. Keep track of whatever assets matter to you and your business, with customizable reports, battery life and motion activation management built into the iTrail tracking platform. Along with Geo-fence alerts you can quickly and easily identify the precise location of every fixed or movable asset in your business with reliable round-the-clock asset tracking and communications. Improve your business, measure driver performance, increase productivity, know where your drivers are in real time, know if there speeding or arriving on time. GPS is another way to help your fleet be productive and increase your fleet’s bottom line profit. GPS tracking helps your business save money in so many ways using our customizable report menu see your ROI quickly.